Samuel Lord and George W. Taylor moved their successful dry goods business into their new 5-story cast iron palace on Broadway at 20th Street in 1870. The cousins enjoyed tremendous success, much of it due to their innovative marketing. One of their pioneering ideas was the installation of Christmas windows. It was the start of a treasured New York City tradition that would sweep the country. Lord & Taylor’s holiday windows put shoppers in the Christmas spirit and, as the cousins knew, that spirit would translate into spending. 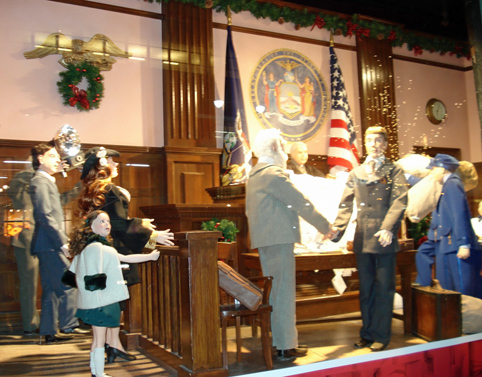 Before the turn of the century, most of the grand emporiums would dress their wide show windows with Christmas displays. The joy of the Christmas window was not always without misfortune. Four days before Christmas in 1901 Christopher Hendricks lit the gas burners that illuminated his windows, catching the display on fire and burning down his store at a cost of $3000. 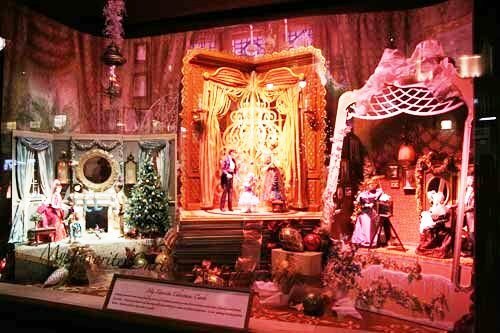 By the middle of the 20th Century department store Christmas windows were as much a part of the New York Christmas season as carols and street corner Santas. In 1959 The Times said that “more than a million eyes have stared at the Christmas windows of the city’s department stores.” By the end of the century that number would be multiplied many times over. 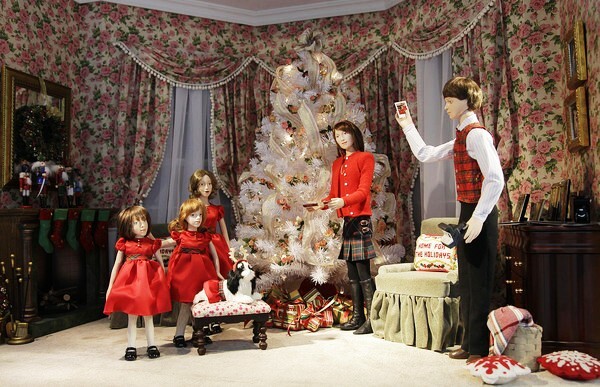 Today Lord & Taylor, who started it all, keeps its tradition of highly detailed and lavishly animated windows. Macy’s, who unveils their Christmas windows the day after their famous Thanksgiving Day Parade, features two sets of windows: On Broadway the windows from 34th Street to 35th Street narrate a story or theme while on 34th Street the revered and wonderfully-animated windows depicting scenes from the movie Miracle on 34th Street are redisplayed each year. 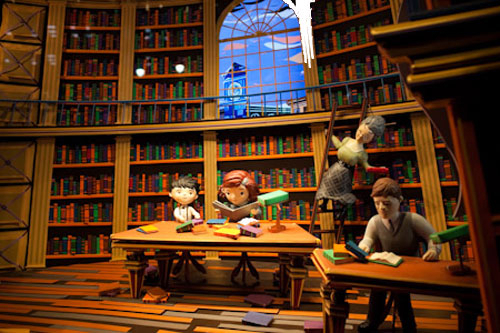 Saks & Company generally tells a children’s story through their 5th Avenue windows while Barney’s trendy and humorously on-the-edge windows are a New York must-see. 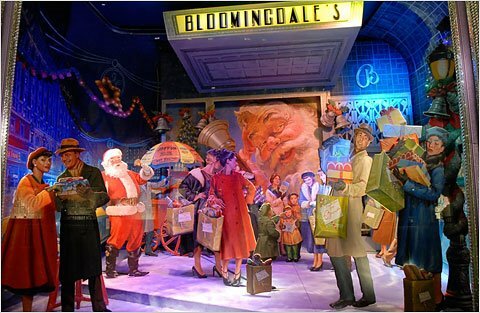 In late November Bloomingdale’s unveils its unpredictable windows – celebrating Andrew Lloyd Webber’s The Phantom of the Opera in 2004 to “A Swing’ Christmas Holiday” in 2008. Reflecting the tasteful goods inside the store, Bergdorf Goodman’s windows are always urbane and sophisticated. The appeal of the Manhattan department store windows is such that velvet ropes are installed to control the lines of tourists and New Yorkers alike. For them Christmas would not be Christmas without the festive, animated windows that, for one or two months a year, do not attempt to sell anything, but simply make the viewer a child again.